Featured Blog #14. When it comes to restaurant and food review, nothing beats Purple Doll. The blog posts are all well written by Sumi Go, a 21 year old writer and photographer. Blog description: The Purple Doll is a personal-turned-food blog detailing the doll's food adventures as she explores Metro Manila’s restaurants, buffets, cafés and even food stalls. It houses not just informative and entertaining food reviews, but also a treat for the hungry eyes. Initially though, The Purple Doll was an online creative outlet for Sumi's photography, writing itch and random ramblings. But amidst her scattered thoughts, the foodie in her prevailed, making The Purple Doll what it is today. Sumi is a jack of all trades, or so she believes. She loves to write, a passion which she discovered when she joined the school publication back in elementary. She also has a strong interest in photography, as well as in web and graphic design. Prior to her blogging days, Sumi enjoyed cosplaying, as well as singing Japanese and Korean songs on Youtube. The Purple Doll has been in the cyberspace for barely 10 months. From the blog name, you can already infer that Sumi wanted it to become her online diary and creative outlet. How did you she into blogging? 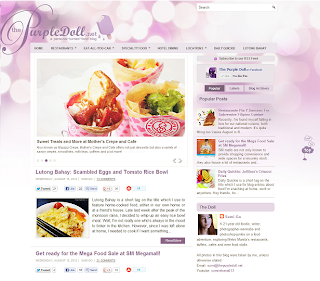 While waiting for her graduation back in October 2011, Sumi started The Purple Doll blog to pass the time. Little did she know that she'll grow attached to the wonders of blogging and will continue to do it even while working. Sumi makes an effort to always put her best in every post that she publishes. And with a continuously growing number of restaurant reviews, it's hard to choose one which she deems to stand out. However if she really has to choose, it'd be Intramuros: Reliving Stories of the Walled City, Sumi's travel write-up entry for the Intramuros Bloggers Challenge 2012 and a post which won her the photography challenge from the same competition. I may be a newbie to the blogsphere, but I'd like to remind my fellow bloggers to keep the flame alive. If you have the passion, nurture it and you'd not only be successful but will also continuously be happy with blogging. Of course, make sure to stay personable and never ever step on someone's toes. I read Sumi's blog and I always end up craving for food which is just a testament of how great a food blogger she is. Sumi's blog posts always make me hungry, haha! I love Sumi!!!! :D Hahahahaha She's an awesome food blogger and a great person. I can say that even though I've only met her once. :) She takes such awesome photos and writes really good articles :D I'm a huge fan! Whew! I didnt know that purple doll is running only for 10 months.. for I was thinking that shes been doing it for years as I idolize her blogging spirit. perfect choice of words and she's right! -she hits a personable attitude towards the readers. I'm glad to have known Sumi! Fellow LaSallian! Woot! :D She really writes well and takes such breath-taking photos! Aside from wonderfully taken photos, she describes each food in the plate in a manner that would make you want to experience yourself. The presentation itself made me forget about my diet. Plus the the writing, oh, I'm on a binge! I like her idea of "keeping the flame alive"
I wonder how Sumi remains so thin despite going to all those restaurants. Must just mean, she's directing us to go to the right type of food. More power to the purple doll! The title of her blog alone is already enticing... The Purple Doll. I do enjoy reading her posts. Before I try out a new restaurant, I'd want to hear what someone has to say about it first. Reviews are important. only 10 months and already gaining good reviews from the readers... Congrats!! The first time I read Sumi's blog I wondered why it's titled The Purple Doll and so with the color is purple. I presume that this particular color is Sumi's favorite. I enjoy reading Sumi's blog from foods and to photography. More power... keep on blogging! Sumi deserved all the credits. I love the way she blog. I idolize her. Sumi's blog deserves this feature slot. It is one of the best in its niche. Thanks for inspiring us bloggers. Sometimes, the knack will just getaway and you miss doing things you do alone. But that's life, keep blogging! Sumi do have a very fine nice blog. Love her food shots. I love her photos most of all. They capture the colors so well. Which makes me wonder "ang ganda nang lighting lagi!" It's nice of you to feature bloggers here. Congrats to the chosen featured blogger. i so loved the blog and info, very usful.